All items on our Full Menu and our Lunch Specials Menu are available for takeout. Please phone your takeout order to (520) 886-0918 for pickup at our restaurant. There is no additional charge if you pick up your order at our restaurant. Our menu items are also available for convenient delivery to your location within a limited area. Please phone us for availability of our delivery service. 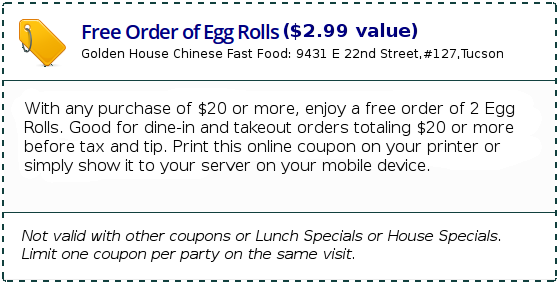 Our Chinese food delivery area is within 5 miles from 9431 E. 22nd Street, Tucson, Arizona. Chinese food delivery with DoorDash is an independent, third-party food delivery service. Golden House has no control over DoorDash’s food delivery prices. Our discount coupons are not applicable on third-party deliveries.